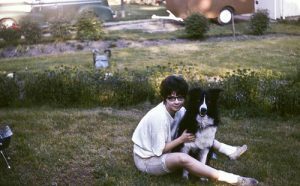 My Mom and her dog, Montgomery. Indiana, 1966. She brought me into the world six years after this photo was taken. She is cute as anything in this photo, isn’t she! You really look like her in this picture. I had to look at it twice. Yup, I definitely am my mother’s daughter. I get lots of my features from her and from her mother.